A NATO airstrike against Libya took the life of Muammar Gaddafi's youngest son, and three of the Libyan leader's grandchildren. The house the Gaddaffi's family members were in was struck by at least three missiles. The attack completely caved in the roof at some spots. Unrest in the Middle East and North Africa places Israel into an alert condition that goes way beyond simply worrying about a terrorist attack against the tiny nation. If any other nation in the world goes to war and loses, it creates a devastating process of retribution, and rebuilding. If Israel goes to war and loses, she ceases to exist. The claim against Israel is that the Jews are occupiers of the land they embrace as their own. The Jews are being compared to South Africa as visitors that have forced their way onto the landscape, and then practice apartheid against the "native peoples." However, the truth is far from agreeing with that claim, for if any people has a claim to their homeland, there is no greater example than Israel. Israel reaches back thousands of years, much like China and India, predating most civilizations, and predating both Christianity and Islam. Their claim to that land goes back to the time of Moses. Even before 1948, the early Zionist movement members that moved to the region purchased the land on which they would farm and live. Any lands that were later captured as a result of war were lands that had been a part of Israel originally, anyhow. The land Israel occupies is but a sliver of what once belonged to the Jewish People, but the fact remains that the Hebrew has called that region home as a specific people for nearly 4,000 years. The twelve tribes of Israel have always considered that land to belong to them, even when they have been scattered time and time again because of an attempt to destroy their nation as we are now currently seeing. . . once again. On May 14, 1948 Israel became a nation once again, and as is the case throughout Jewish history, war designed to destroy the nation was immediately engaged against Israel. Within hours after Israel was given back that tiny sliver of wilderness, and after the United States recognized the new nation, the Arab League declared war against Israel with the full intent of wiping the new nation off the map. Israel was a nation of barely more than half a million people, at that point, and had been a nation for mere hours. Egypt, Jordan, Syria, Lebanon, Saudi Arabia, and Iraq all joined together to destroy tiny Israel. To the surprise of the attackers, the attempt to destroy Israel, commit genocide against the Jewish people, and scatter the scant survivors around the world, failed once again. The attempt to destroy Israel arose again in 1967. Eight Arab nations joined together with the full intent to end the existence of Israel, using their "3 Nos" as their rallying cry. "No peace with Israel. No recognition of Israel. No negotiations with Israel." Israel again survived, and this time gained Jerusalem, and other pieces of land, as a result. The Yom Kippur War in 1973 was yet another attempt to destroy Israel, commenced on one of the holiest days on the Jewish calendar, and once again the attempt by the Arab nations failed. During the Carter administration Egypt's Anwar Sadat signed a peace treaty with Israel, one that they still abide by to this day, for the most part. The rhetoric on the streets during the ouster of Mubarak, however, proved that the animus against Israel in Egypt remains. Jordan signed a peace treaty with Israel in 1994, resolving border disputes at least temporarily. Jordanians are rapidly concluding that there is no real tangible benefit Jordan receives by having a peace treaty with Israel, and are beginning to grow restless with Israel. The other Muslim nations in the region remain hostile. The Israel of today is but a small sliver of the lands Israel once called home. 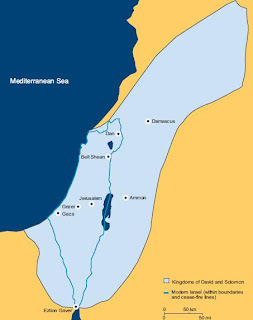 Historically, during the Kingdoms of David and Soloman, Israel extended into Lebanon, Syria, Jordan, the Sinai, and up to the outskirts of Iraq. In other words, to have the borders Israel has today, they did not "steal" that land. The lands Israel inhabits today they have regained. Historically, their own lands were denied to them by Arab invaders, and the Jews now have regained a small part of what was once theirs. In reality, Jews have always lived in Israel, but as a minority among the Arab conquerors. The Jews have lived with neighbors that hold utter contempt for the Jewish people because Islam's Koran promotes as a core belief that all religions are inferior to Islam, and that the Jewish people are no more than swine. Christianity's support for Israel befuddles some observers. The conventional wisdom of the secular population is that Christianity should hate Israel because it was the Jewish elite that fostered hatred for Jesus Christ while the Messiah walked the Earth, and it was members of the Jewish population that cried for Pontius Pilate to "crucify him" when the bloodied Jesus was presented to them as a man with no faults. Segments of Christianity have indeed turned their back on Israel, falling victim to "Replacement Theology," which essentially teaches that the Jews are no longer God's chosen people due to their rejection of Christ as the Messiah, and that Christians have replaced the Jews as God's chosen people as a result. However, most Christians see themselves as adopted into the family of God, that Israelites are still God's children and still receives the Blessings of God despite the fact that most Jews reject Christ as the Messiah, and Christians have adopted into the family through the blood of Jesus Christ. The fact is, Christianity is the second largest faith among the Jews, and Christians believe that God still has many plans for the Jewish People as we enter this age that is considered by many to be the countdown to the return of Jesus Christ. Christians also know that the fall of the Jewish state to present-day Muslim invaders would undoubtedly mark the end of any opportunity to visit the lands Jesus Christ once walked, and would result in the destruction of these Holy places by the hostile Islamic occupiers. The problem is, Israel's enemies have multiplied. No longer are the forces that desire an end to the Jewish nation limited to those of the Muslim ideology. The United Nations has singled out Israel as occupiers and racists against Palestinians since 1950, putting out resolution after resolution against Israel. Even segments of the United States have turned against Israel as aid to the Palestinian Authority has increased, and the current Democrat-led government has continuously snubbed Israel while giving numerous concessions to the Muslim nations of the region. As anti-Israel sentiment increases around the world, Iran has openly threatened to “wipe Israel off the map”, and the two-state accommodation with the Palestinians has surfaced again as a solution that historically has been refused by the Palestinians because their goal is not to split the land with Israel, but to gain possession of all the lands as a result of Israel’s destruction. Israel has been slowly giving up land in the hopes of gaining peace. Longtime Jewish residents have abandoned their homes in Gaza. Meanwhile, Hamas has hammered Israel with constant rocket attacks, a practice that has increased since Gaza has been given to the Palestinians. In an effort to combine their forces against Israel, the rival factions of Hamas and Fatah have joined together. Now, Israel's options have dwindled. The fight for survival has fallen solely on their own shoulders as their allies have turned their backs on them. With Benjamin Netanyahu serving as Israel’s Prime Minister, it has rapidly become obvious that Israel must stand against its enemies, assert its right to its own lands, and perhaps take action against its neighbors before another attack against Israel ensues. To protect itself, Israel may need to take action in Iran against that nation's nuclear facilities, refuse the wrongful demands to limit construction in Jerusalem, refuse the wrongful demands that Israel turn over Jerusalem to Islam, and stand up to its enemies both diplomatically, and militarily. Otherwise, Israel's existence may be at risk. One must remember, the very presence of Israel in the Middle East brings stability to that region that would not otherwise exist. The defeat of Israel puts the entire world at risk, and gives Islam yet another notch in their belt as they set their sights on a worldwide caliphate. The pieces are definitely falling into place for such a scenario. The Arab League is working with the United Nations to set up a No Fly Zone over Gaza. Such a move would not only place Israel at a disadvantage, but would literally pit Western forces against Israel. That would mean that even American pilots would be ordered to face off with the Israeli air force. Of course Israel is willing to accept a mutual ceasefire, even though they figure the Palestinians will not abide by it for long. Israel has continuously shown that they have a desire for peace, even if it means losing land and political advantages to achieve that peace. But, even as Israel backs off once again, Hamas continues to lob missiles into Israeli population centers. Fact is, the Arab League cannot be trusted. They used deception to get the United Nations involved in Libya, and they are working to do the same in Syria and Gaza. The aim is to make The West look to be aggressors, so as to encourage Muslim vitriol against The West, and Israel. They know that the mere power of accusation with cause The West to back off, and give them a free attempt to move on Israel. The Arab League's moves are quite literally forcing Israel's options to dwindle even more, leaving Israel with two options: Defend themselves militarily, or cease to exist. Right up the road a couple months ago one assistant pastor and two elders from Calvary Chapel of Hemet, California, went to the Hemet DMV before it opened and one of the men started to read the Bible aloud. Less than thirty minutes later, he was arrested for "impeding an open business" under Penal Code Section 602.1(b). A security guard told them to stop reading the Bible, and then about ten minutes later, a California Highway Patrolman approached the pastor, took the Bible out of his hands, and arrested him. As the CHP officer was arresting him and putting him in his patrol car, the two men who were with him asked the officer, "What law was he breaking?" Instead of identifying a legal violation, the officer asked, "Were you preaching too?" The other two pastors were then also arrested. Neither of them ever read the Bible out loud anywhere on DMV premises. The charge against the pastors of "impeding an open business" is designed to protect businesses against protestors who block the doors of an open business. The pastors, however, read the Bible at a time when the DMV was closed, and they were standing at least fifty feet away from the entrance. The arrests were performed without any appropriate charge against any appropriate penal code. The purpose of the arrests seems to have been simply to censor the pastors. The pastors have been since released, and no criminal charges have been pursued by the District Attorney. Advocates for Faith & Freedom has filed a federal lawsuit on behalf of these three men for violation of their right to free speech and for unlawful arrest. Security forces killed more than 60 people across Syria on Friday during demonstrations demanding the ouster of President Bashar al-Assad, and the United States imposed new sanctions on key figures. Obama is facing increased pressure to call for the ouster of Syrian President Bashar Assad, as Assad's government continues a violent crackdown on protesters that activists say has killed more than 450 people. But is intervention in Syria something we should be considering, or is it none of our business. . . or at least none our business until it begins to affect American interests? In George Washington's farewell address in 1796, he was careful to explain that unless American interests are directly affected, we should keep out of foreign entanglements, or involving ourselves in foreign affairs. This is not a call for isolationism, only a call to be careful in our choices when it comes to our foreign policies. "We paid our dues, now where's our change," sang the protesters as Obama looked on from the stage. A San Francisco Chronicle reporter filmed the song, and the White House is not happy about it. Then, the Obama administration lied. According to the White House, the San Francisco Chronicle reporter that filmed the protest at the DNC fundraiser broke the rules. The agreement, according to the Obama administration, was for the reporter to only use paper and pen as well as sharing her notes with the White House so that it may be distributed to other reporters. The newspaper says the Obama administration needs to join the 21st century. I personally don't like the idea of the government dictating to reporters what they must and must not do in regards to their reports on the government. Feels kind of Soviet-like when the White House makes that kind of demands of reporters. The reporter in question is Carla Marinucci, and the pool reporting arrangement she had agreed to is a common thing designed to limit the number of reporters at smaller events, while still giving all of the other reporters access to the notes taken by those that attended. During Marinucci's coverage, about a half-dozen protesters attending the breakfast broke into a song chastising Obama for the government's treatment of Pfc. Bradley Manning, an Army intelligence analyst suspected of illegally passing government secrets to the WikiLeaks website. Marinucci pulled out her ever-present small video recorder and captured video of the protest. The video was posted with her written story online. The White House complained, saying the agreement was that she would provide a print-only report. Off the record, the Obama administration threatened Marinucci that she could lose future opportunities to cover presidential appearances. The White House then later threatened to freeze out Chronicle and other Hearst Newspaper chain reporters if they reported on the threat against Marinucci. Josh Earnest, a White House spokesman, later said that officials made no such threat. The president that claimed to be unlike any other politician, and a unifier, has turned out to be just another cockroach. Rather than being open and transparent, the Democrats have revealed themselves to be the thugs we knew they are. Hmmmm. Disturbing, isn't it? Did Superman ever naturalize? We know he was born elsewhere, and I don't recall him ever going through the legal process to be a resident alien. Heck, his planet exploded, so Superman doesn't even have a birth certificate, much less the long form. Then again, if he is going to be hob-nobbing with the United Nations, as the comic indicates, he's hardly worthy of being an American anyway. Wow, the more I think about it, perhaps it is better Superman heads on out. If he's not even willing to follow immigration law, how can he be trusted to protect the American Way? Royal Wedding Coverage. . . Who Cares? The billboard read, "Royal Wedding All This Week!" All week? Doesn't overkill make people sick of things? I am not impressed over the wedding, nor do I care. These people still sneeze, puke, crap and wipe their nose like the rest of us. They are nothing special to me, and I could care less about their wedding. Sure, I hope they do well, and that this is a match made in heaven - but I will leave the details up to them. I have better things to do than to drool in front of a television, wishing I was a royal, or acting excited over the dress the bride wears, or the attitude of the groom, or whatever else catches folk's fancies. Luckily, I'm not one to watch much television. My TV comes on for football, baseball, and UFC - with an occassional stint into hockey, basketball, Fox News, or Firefly. You know. . . the important stuff. Therefore, I have not been bombarded with that bloody royal wedding. One of the couples that attends my Constitution Class in Temecula on Thursday Nights belongs to Campaign for Liberty, which is a group that supports Ron Paul for President. As is customary after class, a group formed around me in the parking lot asking questions. One of the main questioners is often a young man in the 8th Grade who is homeschooled, and has been a regular with his mom to my class for quite a while. The young man had a list of questions, and reading from his notes, he asked me if I thought Obama could win in 2012. I replied, "No." However, I added that we must not underestimate the power of Democrat Party tactics, and the power of accusation. A great example is their attacks against Sarah Palin. Nearly all of the Left's accusations against Palin are false, and have been proven to be so. Yet, I still hear liberals spout the lunacy. Many of the sheep still believe that Palin was a book burner, separatist, and said that she could see Russia from her house (Tina Fey said that while impersonating Palin). It didn't matter to the Left how insanely inaccurate their accusations were. The mere utterance of the inaccuracies lured people in, and made a mockery of the woman. Meanwhile, nobody noticed when Obama claimed there was 57 states, called Pennsylvanians bitter gun and religion clingers, was willing to talk to Iran without pre-conditions while also uttering that the U.S. needed to work to bring about "changes in behavior" by rewarding Iran when they do good, said in a speech that Pearl Harbor was destroyed because of "a bomb that fell on Pearl Harbor," said his Grandpa helped liberate Auschwitz (when it was the Russians), and of course all of the flip flops that are still going on. "This is where Trump will be so valuable, should he run," I continued. "I don't think Donald Trump is a conservative, nor is he electable. However, he has fire that the Republicans don't have, and Trump's presence in the campaign will ignite other fires. Of course who I would really like to see is either Allen West or Rand Paul, but as freshmen in Washington, they will sit this one out. Michelle Bachmann is great, but I don't think she will overcome the attacks, or shake that idea that Representatives don't get elected. She will, however, by running, ensure that the Tea Party message (and influence) remains a main point in the election. DeMint will do the same, but not gain the nod. Idealy, I'd like to see Herman Cain gain it, but I think lack of recognition will be his undoing. After all of the dust settles, I think we will be surprised, because I think the one that has the strongest chance is Tim Pawlenty." "What about Ron Paul?" asked the Campaign for Liberty couple. "I disagree with Ron Paul on the same things his son, Rand Paul, disagrees with him on." "Foreign policy," the couple inserted. "Yeah," I said, "That's a part of it." I agree with Ron Paul that we should not get involved in foreign entanglements that do not concern us. I think, unlike Ron Paul, that there can be made a fair argument in favor of invading Iraq and Afghanistan. I believe Saddam's association with al-Qaeda, and the practice of supporting terrorists, made it our problem as well, giving us the green light on military operations. I am not real hip on the Libya thing, however, and question the current American foreign policy regarding the upheavals in other Muslim states. Ron Paul is a fine Representative, and understands the Constitution more than most of those cockroaches. However, aside from his foreign policy, I am rubbed the wrong way by the crowds he attracts. . . like "Truthers" (9/11 conspiracy nuts). I believe that Ron Paul is on the money 80% of the time. Unfortunately, he's loony the other 20% of the time - and I can do without that 20%. I hear Ron Paul is launching an exploratory committee. More power to him. It is great that he is involved. But of all the Republicans considering running, I think he (and maybe Trump) is the candidate that would most likely be beat by Obama. And that is saying something since I have said that I think Mickey Mouse and Elmer Fudd could beat Obama in this upcoming election. America's deadliest tornado outbreak in almost four decades has now claimed at least 280 lives in six states. The majority of the deaths have occurred in Alabama, where large cities served as ground zero for the killer twisters. Technology's warning capabilities was unable to stop the carnage. With larger than usual storms bearing down on heavily populated areas, it was just too much for the entire population to prepare for. These supercell storms came astonishingly quickly, were astonishingly thick, and the most powerful tornado of the group threw debris around freely as it leveled neighborhoods. It is believed that the tornado that struck Tuscaloosa, Alabama, was an EF5, which is the strongest category of tornado, with winds of more than 200 mph. Now, intense flooding is invading the affected areas along the Mississippi and Ohio Rivers. Ratified in 1933, the Twentieth Amendment establishes the beginning and end of the terms of the elected federal offices. The amendment moved the beginning of the Presidential, Vice Presidential and Congressional terms from March 4. Congress would convene on the third day of January, reducing the amount of time a lame duck Congress would be in session. The terms of the President and Vice President were moved to the 20th day of January. Also, another key point as a result of this amendment, is that if the Electoral College fails to resolve who will be the President or Vice President, the newly elected Congress, as opposed to the outgoing one, would choose who would occupy the unresolved office or offices. In addition to the 20th Amendment, tonight we will also be discussing The Electoral College. Special Thanks to: Faith Armory, 27498 Enterprise Cir. W #2, Temecula, CA 92562; 951-699-7500, www.faitharmory.com - For providing us with a classroom to meet in every Thursday night at 6:00 pm. Myth #4: The Supreme Court interprets the Constitution, and can decide if a law is constitutional or not. This is the Fourth Myth in the series: 25 Myths of the U.S. Constitution. The idea of the federal court system determining the constitutionality of laws has become as common as hot dogs and apple pie in America. Laws are constantly challenged regarding their constitutionality, and inevitably these challenges wind up being decided by a federal court. The common belief is that the U.S. Supreme Court is the final arbiter of the U.S. Constitution. The problem is, there is no place in the U.S. Constitution that gives the courts that kind of authority. The judges of the British judiciary, during the time of the American Revolution, carried nearly as much power as the king. The smug old men wore their powdered wigs arrogantly. Save for the occasional kingly correction, the rulings of the judges were final. They served the aristocracy, and suppressed dissent. The law was interpreted by these powerful judges, especially when it was in accordance to the whims of the monarchy. When George Washington was elected president of the United States, the people around him asked what he would like to be called. Your majesty? Your excellency? Your honor? Washington told his admirers that Mr. President would be sufficient. Like most of the founders, Washington did not desire status for the sake of status. A lust for position was better left to the aristocrats of Britain, as far as Washington was concerned. No American was better than any other. Some were fortunate enough to serve the new country in an official capacity, but that opportunity belonged to anyone that should decide to pursue it. In America there was no aristocracy, no preferentially treated position of privilege, and no elite ruling class. As a result of the founder's negative opinion of elitism, the word "uniform" was used often in the U.S. Constitution. "All men are created equal" was more than just a phrase from the Declaration of Independence. As with today, there were those back then that believed governments run best when guided by a political elite made up of educated aristocrats who have some hidden wisdom that enables them to recognize the presence of a General Will. These folks looked up to the British system of aristocracy, mercantilism, and empire. The only obstacle between these elitists, and empire, was the Constitution, and the vote of the people - which brings us back around to the courts. The attempt to centralize the United States Government into a system reminiscent of the British system failed. Alexander Hamilton's Bank of the United States did not work, and the political headway achieved through Adams' presidency was all but erased when Thomas Jefferson won the presidency in the close election in 1800. Unable to achieve their statist end through political means, Hamilton, and his fellow big government cronies, turned to the judiciary, and more specifically, Chief Justice John Marshall. One of those judges was a man named William Marbury. He sued, and the case worked its way up to the Supreme Court. After all of the dust settled, on February 24, 1803, the Court rendered a unanimous (4-0) decision that Marbury had the right to his commission, but the court did not have the power to force Madison to deliver the commission. Chief Justice Marshall wrote the opinion of the court, and in that opinion he wrote that the federal court system has the power of judicial review. Rather than simply apply the law to the cases, Marshall had decided based on case law that the courts have the authority to determine the validity of the law as well. This opinion, however, went against all of the limitations placed on the courts by the Constitution. One of the most obvious fundamental principles of the Constitution is the limitations it places on the federal government. The Constitution is designed not to tell the federal government what it can't do, but to offer enumerated powers to which the authorities of the federal government are limited to. The powers are granted by the States, and any additional authorities must also be granted by the States. The process by which this can be accomplished is through the amendment process. Remember, it takes 3/4 of the States to ratify an amendment. Let's think about this for a moment. The federal courts are a part of the federal government. The Constitution was designed to limit the authorities of the federal government by granting only a limited number of powers. Judicial Review enables the federal government, through the courts, to determine if the laws that the federal government made are constitutional. In other words, the federal government, through Judicial Review, can determine for itself what its own authorities are. The Supreme Court took that power for itself (and a government that takes power, or should I say "seizes" power, is a tyranny in my book). Do you think that is in line with the limiting principles the Founding Fathers originally set forth? So, the idea that the federal courts, or the United States Supreme Court, has the authority to interpret the Constitution, and can decide if a law is constitutional or not, is unconstitutional. The myth has been perpetuated by the courts in the attempt to gain power, and work towards a more centralized big federal governmental system. One of the ways subverting the Constitution is achieved, aside from Judicial Review, is Implied Law, but we'll discuss that when we get to Myth #22. Storms brought major flooding in Arkansas and Missouri, and at last count 138 violent tornadoes have ripped through Alabama, Tennessee, Mississippi and Georgia. At least 72 people have perished as a result of these storms. Tuscaloosa is claiming over 100 injured, and 375,000 Alabama residents are without power. The tornadoes are a result of a line of severe thunderstorms extending from eastern West Virginia to southern Alabama. CNN is reporting that this swarm of tornadoes could be one of the most devastating tornado outbreaks in the nation's history. 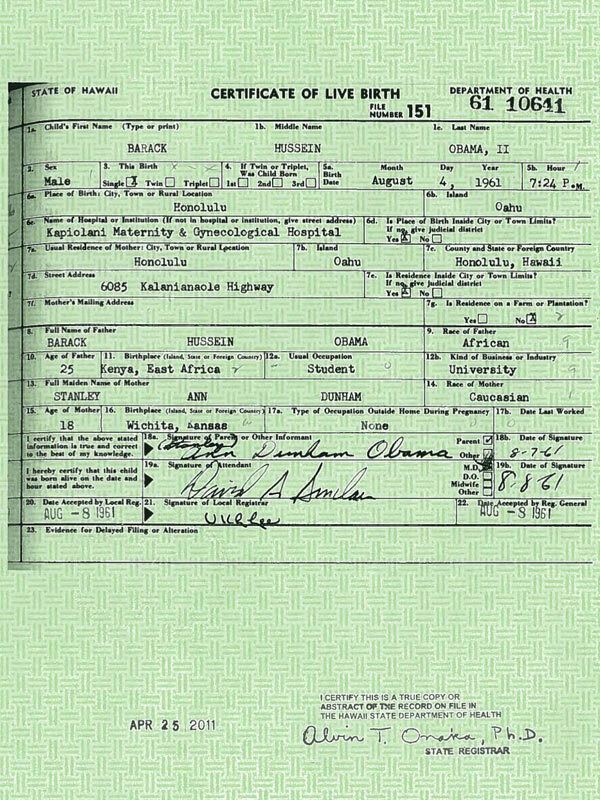 At long last Barack Hussein Obama has released the long form of his birth certificate. A couple years ago it was suggested that the White House was working on a forgery. If this is a forgery, then the question would be: Why wait so long to release the copy? If it is not a forgery, then the question would be: Why wait so long to release the copy? When I heard about this earlier today, the radio broadcaster announced, "Obama has released the long form of his birth certificate, proving he was born in Hawaii, which makes him eligible to be President of the United States." My fascination with the birth certificate question has been not that without it he is ineligible, but instead, why was he not presenting it? What was Obama hiding? I wondered if under the father's name it read "Frank Marshall Davis," or something. But as I have explained a number of times, I really don't care if he was born in Hawaii, Kenya, Indonesia, or the moon. His eligibility for the presidency has hinged on the definition of Natural Born Citizen, and the definition of a Natural Born Citizen is not simply being born in the United States. A woman recently argued with me at an event saying that us Tea Party folk had the 14th Amendment all screwed up, and that was why there was a question. She said, "It clearly states in the 14th Amendment that all one must do to be a natural born citizen is be born in the United States." Ben Franklin owned three copies of the book. Two for the Constitutional Convention, and one for himself. The importance of the Law of Nations was so prevalent that a couple years after the Constitutional Convention, George Washington checked it out from the New York Public Library. Unfortunately, for the library, he never returned the book. So, on the long-form that has been presented, Barack Obama Sr. is listed as Barry's father. 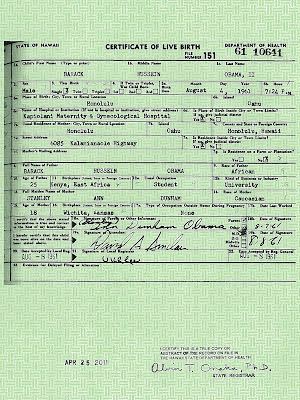 Barry has admitted himself that daddy was born in Kenya, and was not an American Citizen. But to be a Natural Born Citizen, both of your parents need to be Americans at the time of your birth. Therefore, regardless of any birth certificate, or other proof of where Barry was born, he is still ineligible. Sarah Knopp, a Los Angeles teachers union leader (in the Tax the Rich shirt) and Megan Behrent a New York City teacher affiliated with the International Socialist Organization, explain how to push Marxism in the public school classroom. A Mississippi state judge has issued an order to public school attendance officers in his judicial district to provide the names of all homeschoolers there, prompting alarm at the Home School Legal Defense Association, which fights for the rights of homeschooling worldwide. The order apparently is because the judge himself wants the information, as there appeared to be no case, motion or dispute prompting the request. The HSLDA, which was alerted by its members in the 13th Chancery Court district in Mississippi, where Judge Joe Dale Walker issued the order, immediately sought and obtained a stay of the order from the state Supreme Court. The judge's order noted that the "cause" for the order "came on for hearing on the court's own motion," but the HSLDA said apparently no hearing ever was held – and the order is the only document in the court file. President Barack Obama claims to be a devout Christian, yet has a history of mocking Christianity, attending churches run by anti-American preachers, and pays more homage to Islam. The White House has provided statements recognizing the observance of major Muslim holidays, while refusing to participate in the National Day of Prayer, and making Easter a side note. The White House even gave more attention to Earth Day (for the religion of environmentalism), than to Easter. The president’s weekend address did not mention Good Friday, and only gave Easter a slight mention. If you will remember, last year Obama snubbed Easter in a different manner, releasing an all-inclusive Easter greeting that reached out to Jews, Muslims, Hindus, and people of no faith at all in a statement about a holiday that is uniquely Christian. 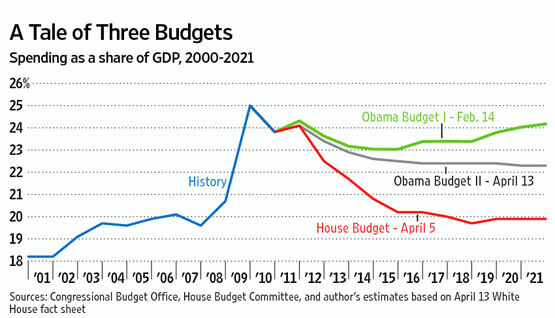 And Obama dares mention cutting spending? Sounds like a Marxist Soviet, doesn't he? And these scum are in America, going after the children, and working to destroy the American Form of Government. . . and they are the allies of the progressive liberal left. The last time gas prices reached four dollars a gallon, George W. Bush threatened to drill domestically, and immediately prices dropped. And this is not the first time this has happened. During the early 1980s Ronald Reagan announced that we were going to start drilling to drive down prices, and the mere threat of drilling made the Jimmy Carter oil crisis history overnight. The Democrats say that "Drill Baby Drill" won't do anything to bring down prices. Yet, Obama was willing at one point to release some of our emergency reserve. Why? Because an added supply brings down oil prices, and he knows it. But, simply because the GOP supports domestic drilling, the Democrats oppose it - despite the reality of Supply and Demand. Enter into the picture Shell Oil Company. Shell Oil Company planned on drilling in the Arctic Ocean off the northern coast of Alaska. However, they now have announced that they will be scrapping those efforts because the EPA’s Environmental Appeals Board decided to withhold critical air permits. It is as if these progressive liberal left loons want America to fail, and want the gas prices to keep going up. And this is not even mentioning Obama's decision to pay Brazil to drill, while enforcing a moratorium in the Gulf against American companies. Besides, since when does the EPA have the constitutional authority to dictate to a private business in such a way? Shell abandoning these plans to drill follows five years and nearly $4 billion dollars on plans to explore for oil in the region. The leases alone cost $2.2 billion. The EPA’s appeals board ruled that Shell had not taken into consideration emissions from an ice-breaking vessel when calculating overall greenhouse gas emissions from the project (because of the man-made global warming myth). Our economy, and gas pumps, will suffer as a result. What are we missing out on? 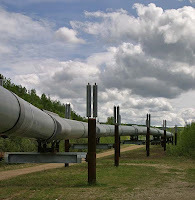 An estimated 27 billion barrels of oil. 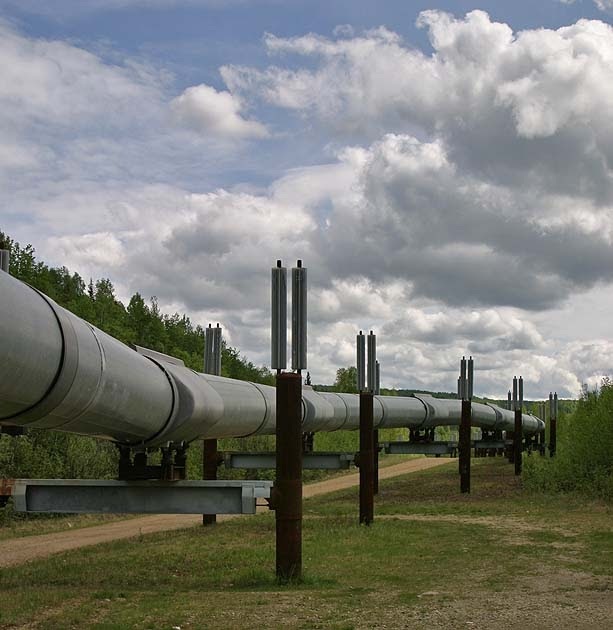 That would be about two and a half times more oil than has flowed down the Trans Alaska pipeline throughout its 30-year history (which is currently at only a third of capacity). The EPA believes it is above the law, above the constitution, above any checks by other agencies, and the final word on anything they decide to undertake. Didn't we fight a revolution against a king for the British acting the same way? The improvised explosive device or I-E-D was disarmed by a bomb squad using a robot. No one was hurt. Parts of Highway 77 were closed for several hours. A proclamation is not a law. The executive branch has no legislative powers. Therefore, the National Day of Prayer is not unconstitutional. No law was passed requiring participation, and besides, no particular religion is offered anyway. Nonetheless, atheists took the National Day of Prayer, claiming it violates the establishment clause, to court. A federal appeals court tossed the challenge to the proclamation, rejecting the arguments because there was no legal injury. . . just hurt feelings. "We're extremely pleased that the appeals court rejected a flawed decision and determined that while some may disagree with a presidential proclamation, they do not have the right to silence the speech they don't agree with," said Jay Sekulow, chief counsel for the American Center for Law and Justice. "The appeals court correctly concluded that the plaintiffs lacked standing to challenge the National Day of Prayer. This decision represents a victory for our nation's heritage and history – protecting a long-standing tradition that's been a part of our country for centuries," he said. The court found "the 'psychological consequences presumable produced by observation of conduct with which one disagrees' is not an 'injury' for the purpose of standing … Plaintiffs have not altered their conduct one whit or incurred any cost in time or money. All they have is disagreement with the president's action. But unless all limits on standing are to be abandoned, a feeling of alienation cannot suffice as injury in fact." Prayer goes all the way back to the founding of this nation. In fact, Benjamin Franklin recommended prayer before each session of the Constitutional Convention. Later, prayer began each session of Congress as a result of Franklin's letter suggesting prayer. In 1952 President Harry Truman established an annual National Day of Prayer. It was amended in 1988 by President Ronald Reagan, making the day of the event the first Thursday in May each year. The tradition of designating an official day of prayer began with the Continental Congress in 1775, after which George Washington issued a National Day of Thanksgiving Proclamation. Historically, all 50 governors have issued proclamations in honor of the National Day of Prayer. With a 5-0 win, Weaver goes the distance against the Oakland A's, becoming the first Major League pitcher in history to win his sixth game by April 25th. This is his second straight complete game of the season, his 6th for his career. Congratulations, Weaver. You are definitely an ace. Nationalism is love of government. European society is where the Democrats wish to lead America. We are about a decade behind them, we are told, and need to catch up. Personally, I take great pride in America's exceptionalism. Liberalism in Europe has proven to fail. Progressives in Europe have destroyed those societies, and it would do us well not to follow in their footsteps. Pupils in some schools in the United Kingdom are being taught about euthanasia with a video featuring a notorious assisted suicide campaigner nicknamed Dr. Death. Dr. Philip Nitschke is shown in these "educational" videos demonstrating his machine that delivers lethal injections. The film is being shown to pupils as young as 14 years of age across Britain. There is also footage of him giving workshops on assisted suicide methods, footage that have led local church leaders to criticize the film as an 'invitation to commit suicide'. The argument supporting the use of the video in schools points out that the video provides both viewpoints of the issue, including many comments from opponents of euthanasia. The promoters of the practice of assisted suicide who are behind showing this film to kids in school state that they have been receiving extremely positive responses from both pupils and teachers. Those that oppose the film being used in schools claims that irregardless of parental opinion, the extreme views of Dr. Nitschke are being pushed on these children at a critical stage in their development when these children are most impressionable. While it seems on the surface reasonable to discuss this issue on euthanasia and assisted dying to some folks, I am appalled that the feeling that there even needs to be a discussion in the first place even exists. What kind of society have we become when death has evolved into something that is nothing more than yet another method one can inflict upon oneself? And to take it a step further, we don't know the mental makeup of the people viewing this heinous material. How do we know that this video isn't promoting suicide among these children in their minds, or that due to mental difficulties these children are being affected in other damaging ways by viewing this video? As Psychologist Dr Arthur Cassidy, a director of the Yellow Ribbon anti-suicide program, has said: "This video. . . has the potential for young people to think about ending their lives." This is just another way for the progressive madness to encourage the people they see as mere numbers to experiment in suicide, and further more, desensitize the population to the point that other methods of death, like eugenics, which is used to eliminate what is considered by the elite to be "defective" citizens, will be seen as nothing more than standard fare. We are being moved in the direction of becoming a culture of death, with abortion and euthanasia now considered as nothing more than normal procedure. So, the logical conclusion of this kind of progressivism is to work to create a perfect race by weeding out the undesirables, and doing it through the culture of death that the progressives have created. Throw in the belief that we are over-populated, and the masses can be manipulated to accept such heinous programs of eugenics, compulsory sterilization, and other methods of bringing about a utopia - a master race - with relative ease. This film even could encourage young people to think they are a burden, and that if they don't fit in to society according to the standards of the elite, the way out is as easy as euthanasia. In that sense, it creates a system where eugenics may not even have to be forced upon the people, for the undesirables will be voluntarily be removing themselves from the populace. Dangerous stuff, with horrific potential. Perfect example of the elitist mentality. . .
Says the woman that doesn't even understand the Constitution. In Article I, Section 8, Clause 10, the Constitution makes reference to the Law of Nations, capitalizing the title of Vatell's book in the text. It has long been my argument that Vatell's Law of Nations was highly influential on the Founders, especially when it came to definitions such as the one for Natural Born Citizen. Benjamin Franklin owned three copies of the book, having two for the Constitutional Convention, and one for himself. The liberal left has combated me on this issue, saying to me that there is no indication that Vatell's Law of Nations had the kind of influence that I claim on the Founding Fathers. Interestingly enough, the truth has a way of revealing itself. One such indication that Vatell's Law of Nations was indeed something the Founding Fathers read, and relied upon, comes from a recent story about George Washington, and his debt to the New York Library. It seems that George Washington failed to return his library book, which by the way was Vatell's Law of Nations. The fee for his failure to return the book and another book? Today it has reached over $300,000. In 1789, Washington borrowed from the New York Public Library Vatell's Law of Nations and the twelfth volume of a 14-volume collection of debates from the English House of Commons. Neither book was ever returned. The library doesn't want the fine, just the books, and word has it that Mount Vernon has a couple copies of the book from Washington's collection, and promptly returned the books (though it is possible the returned ones weren't necessarily "the" books) to the library. Change begins at the local level, but simultaneously, we must be also working at the national level. The election of 2010 that saw a landslide in favor of the Tea Party in the House of Representatives, an increased conservative presence in the U.S. Senate, and an incredible turnover in favor of the GOP in State governorships and legislatures, was a huge step in the right direction. But if we are not also working to change the system back to its constitutional foundations at the local levels as well, all of that work is for naught. The State and Federal politicians of the future often come from the local governments. If we continue to allow the same old political establishment with its line of succession, and elitist circles, to maintain control of our local governments, the clean-up at the top will only be temporary. 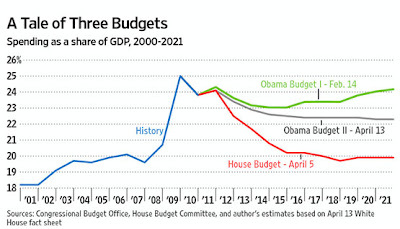 Spending is the primary issue that seems to be emerging. 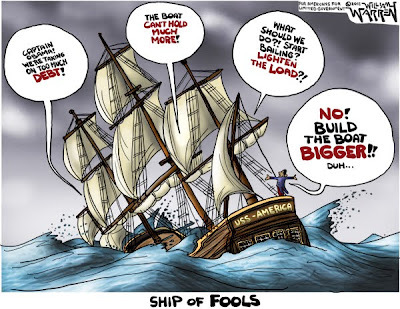 The Tea Party freshmen we sent to Congress in Washington was sent there to cut spending, and return the federal government to the limiting principles set forth by the U.S. Constitution. But instead of making real progress with real cuts in spending, we are witnessing compromises that give us only thimble-full cuts in spending, and a plan to raise the debt ceiling. The argument used against the conservatives is that with too big of cuts, or a failure to raise the debt ceiling, the entire system will topple, and plunge us into an economic tailspin that will result in another Great Depression. The GOP, and many of our fellow members of the populace, hear the threats, quiver in fear, and give in. This is not what we sent the freshmen to Congress to do, and to allow these threats to have this kind of impact continues to set the template used by local governments as well. Granted, the debate has shifted, and the politicians claim they are working to get spending under control. Cities, as well, are looking to reform pension plans, and get their budgets under control. We are having an impact. But understand that the establishment of the political elite won't give in that easily. They will appear to agree, and do a couple things for show, but ultimately we must ask, "Will there be any real progress?" So far, the political cockroaches have been unwilling to make serious efforts toward cutting spending or consider much needed reforms, and that charge is being led by the Democrats whose very existence in government depends on a continuance of heavy spending and a whole slew of entitlements to remain in place. They get their votes from the bottom feeders because they promise to continue to give gifts from the treasury, whether the government can afford it or not. As we have seen recently in the threats by Standard and Poor, and as we are watching with our still struggling economy under the weight of such extreme government spending, if things don't get turned around soon, and that means cuts in the trillions, rather than the billions, the United States is headed for a new role in the world. . . as a nation functioning under a second-class status. The liberal and Republican establishment approach is clear: Spend, spend, and then spend some more. Any serious cuts to government spending is countered with claims that the fiscal conservatives are trying to shutdown the government, kill women, stop cancer research, and take benefits away from the elderly. Then many of the GOP establishment cower, mutter "okay," and nothing changes. Hence, House Speaker John Boehner's compromise that, though the deal is being spouted as the largest spending cut in history, still fell way short. The Left knows its strategy well. Make threats, personally attack, and then continue to do as they have been doing. The Democrats work to protect their entitlement programs, the labor unions work to maintain their power over this nation, and the takers in the nation continue to take and take and take from the producers and achievers in this nation. And if the fight was this brutal over spending cuts that are nothing more than spittle in the ocean, then God help us in the fight to stop the increase in the debt ceiling, or the fight to pass budgets like Paul Ryan's. This is not to say our goals are out of reach. This is just to say that the fight to get everything back on track will not be an easy one. To achieve victory we must remain consistent and persistent, while working to change the culture of politics from the ground up - beginning at the local level. If we allow the politicians to continue to avoid responsibility, if we allow them to continue to spend, the results will be devastating. Simply put, we don't have the money to continue as we have. We cannot continue down this unsustainable path. We need real entitlement reform, real spending cuts, and local changes with local people that understand that they will be next to continue the fight at the State and National level. Cutting a few billion does not steer our boat away from the "point of no return," it only slows our progress towards disaster. Turning this around requires serious changes, and cuts in the trillions. Any less is simply slowing down our plight - not stopping it. Our victories right now are small, but at least we are turning it around. Now is not the time to rest. Now is the time to demand more. In the future, these fights will become more difficult, and the battle over entitlement and budget reform must advance to spending cuts in the trillions, not billions. But this won't happen until we begin to truly change the culture of politics from that of an establishment that believes it is there to rule, to a system of statesmen that understand they are there to serve.